In a world where the population is expected to reach 9 billion by the year 2050, grain production must increase to meet rising demand. This is especially true for bread wheat, which provides one-fifth of the total calories consumed by the world’s population. However, climate change threatens to derail global food security, as instances of extreme weather events and high temperatures reduce agricultural productivity and are increasing faster than agriculture can naturally adapt, leaving our future ability to feed the global population uncertain. How can we ensure crop production and food security for generations to come? In order to continue feeding the planet, it is imperative that we identify crop varieties that display adaptive and quality traits such as drought and heat stress tolerance that will allow them to survive and flourish despite environmental stresses. For this reason, a recent study by Sehgal et al, “Exploring and mobilizing the gene bank biodiversity for wheat improvement,” was conducted to characterize wheat seed collections in the CIMMYT germplasm bank to identify useful variations for use in wheat breeding. The study analyzed the genetic diversity of 1,423 bread wheat seed collections, which represented major wheat production environments from around the world, particularly regions that experience significant heat and drought. 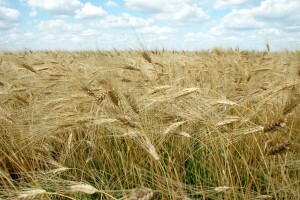 The tested collections included synthetic wheat varieties, which are novel bread wheat varieties created by making crosses between the progenitors of modern bread wheat, durum wheat and wild grassy ancestors; landraces, which are local varieties developed through centuries of farmer selection; and elite lines that have been selectively bred and adapted. The samples were analyzed through genotyping-by-sequencing, a rapid and cost-effective approach that allows for an in-depth, reliable estimate of genetic diversity. 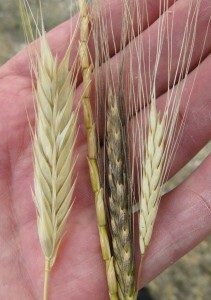 Ancestors of modern wheat, right, in comparison with an ear of modern cultivated wheat, left. The results of the study suggested that many of the tested landraces and synthetics have untapped, useful genetic variation that could be used to improve modern wheat varieties. 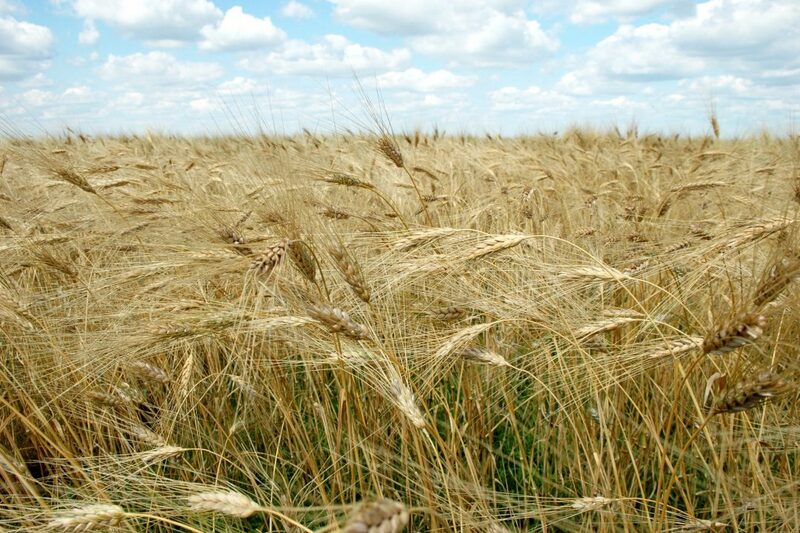 When combined with elite wheat germplasm, this genetic variation will increase stress adaptation and quality traits as well as heat and drought tolerance, thus leading to new wheat varieties that can better survive under climate change. The study also found new genetic variation for vernalization, in which flowering is induced by exposure to cold, and for glutenin, a major wheat protein responsible for dough strength and elasticity. Based on the information generated by the study, over 200 of the diverse seed collections tested have been selected for use in breeding and to discover and use the new specific forms of genes for drought and heat stress tolerance they contain. This new genetic diversity will help bread wheat breeding programs around the world to create new varieties to feed the world’s growing population in a changing environment. This research is part of CIMMYT’s ongoing Seeds of Discovery (SeeD) project, which is funded by the Mexican Ministry of agriculture and rural development (SADER) through the Sustainable Modernization of Traditional Agriculture (MasAgro) project, as well as the CGIAR Research Program on Wheat (WHEAT). SeeD works to unlock the genetic potential of maize and wheat genetic resources by providing breeders with a toolkit that enables their more targeted use in the development of better varieties that address future challenges, including those from climate change and a growing population. Exploiting genetic diversity from landraces in wheat breeding for adaptation to climate change (2015) Lopes, M.S., El-Basyoni, I., Baenziger, P.S., Sukhwinder-Singh, Royo, C., Ozbek, K., Aktas, H., Ozer, E., Ozdemir, F., Manickavelu, A., Ban, T., Vikram, P.